Make sure this fits by entering your model number. 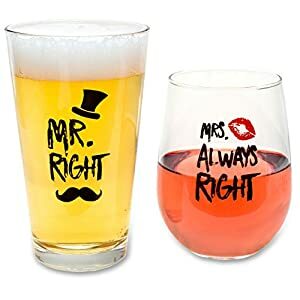 ENGAGEMENT GIFTS FOR COUPLES - Beer pint glass and wine glass combination sure to make the bride and groom laugh. At least the bride anyway... BRIDE AND GROOM GIFTS - Best wedding gifts for the couple. Or even a wedding anniversary gift for the couple!